Kentico CMS 12 was released in November 2018, bringing along with it a shift in technologies for Kentico developers. The differences between the traditional Web Forms based Portal Engine development model and the MVC development model can be found on Kentico’s FAQ page. This development side of the MVC Widget component pattern involves two parts. The live state of a widget is shown when the viewer is viewing the live site (the url in the browser would be the MVC url). The editing state is shown when the viewer is inside the CMS Pages module and viewing a page on the MVC that has widgets configured within areas of the page (the url in the browser would be the CMS url). These areas of the page where widgets can appear are called Sections and while we won’t be covering them here you can read more on how to set them up in the Kentico documentation. More about how widgets, inline editors and the overall ‘Page Builder’ technologies work can be found on Kentico’s documentation site. Kentico’s Dancing Goat site, which can be installed via the Kentico Installation Manager, demos several pre-built widgets and inline editors. While reading the documentation on widgets I would recommend exploring this codebase to get a better understanding of how all the pieces fit together and what the technology enables. 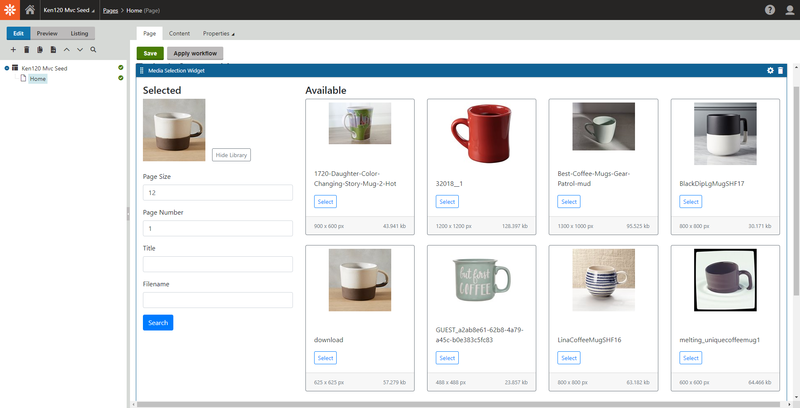 How can we use MVC Widgets? Note: You might notice my namespaces don’t match the typical App.Controllers / App.Models folder structure. This is because I’m a proponent of the Feature Folders pattern for any application and avoid building out my app along the lines of Framework Folders where possible. I always keep my Controllers and Models together, and in non-Kentico MVC projects I keep my views with them as well. I gave a talk on this topic and the slide deck is available online. First, we create the widget properties class named MediaSelectionWidgetProperties which defines that widget data persisted to the database. A single widget can persist multiple values customized by content editors and will leverage separate inline editors to edit each one. Here we see an [EditingComponent] attribute which lets us use a pre-defined Kentico forms Input Component (IntInputComponent) that will show up in a modal when a gear icon on the widget header bar is clicked. You can read more about how to use these already existing components in the Kentico documentation. We also create the widget view model class named MediaSelectionWidgetViewModel which defines the shape of the data we are sending to our widget partial view. This is typically a combination of our widget properties class and additional values or settings from the application that we have access to in our widget controller. We then need to create a widget controller, here named MediaSelectionWidgetController, and register it with Kentico via the [RegisterWidget] Attribute. We also use this class to pull the widget properties from the database (with Kentico’s help!) and populate the widget view model with any data we’d like to have available in our partial view. I’ve added comments in places that deviate from Kentico’s patterns in their documentation, specifically creating the MediaSelectionControllerMeta class and the IMediaFileQuery / ISiteContextProvider / CmsConfiguration types. Now we need to create the partial view referenced by the path Widgets/_MediaSelectionWidget and the inline editor view model MediaSelectionEditorViewModel that we pass data to when in edit mode. 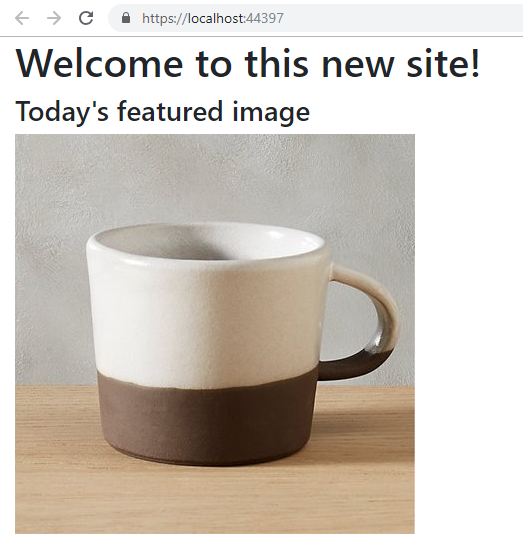 You can see here that if Context.Kentico().PageBuilder().EditMode evaluates to true we show our MediaSelectionEditor inline editor, otherwise we show the image associated with our widget instance by using Kentico’s ImageUrl() helper method. Thus in the CMS, when viewing a page that this widget is associated with, we will see an editor but on the live site we render out an image as we would expect. We cannot (reliably anyway) edit multiple widget properties with the same inline editor. This is why you see the assignment of the widget property name to the PropertyName property of the inline editor view model. For every widget property we want to edit with an inline editor we will need to ensure this PropertyName property has the correct value. Finally, we will create the partial view of our inline editor referenced by the path InlineEditors/_MediaSelectionEditor. There are some things to note as we are finally getting into the Vue.js layer of the widget. First, our Vue app will need a unique HTML element selector to hook into to render itself, so we generate a unique id string to set as our <div id="@id"> value. The helper method that does this is pretty simple and uses the .NET Path.GetRandomFileName() method to get a random string of valid characters. We could have multiple widgets each with their own instance of this inline editor on the screen at one time or even multiple instances of the same Inline Editor in the same Widget, so one unique id isn’t enough — we need a unique value for every instance. Fortunately once we get the Vue.js layer of the app we can use even better patterns for state management and information passing. Finally, you can see that we use a custom HTML element <media-selection-editor> with several attributes prefixed with a colon. Vue.js will take values we register with the Vue app and bind them to these attributes which makes them available to this custom component. There is also a custom event that the <media-selection-editor> component emits, which is defined by v-on:dispatch which we handle in our root Vue.js app with the callback onDispatch($event). You can also see that the randomly generated @id is being used as the value for the id of our Vue.js app hook point. And of course comprehending the Vue.js code will require checking out the docs if you are unfamiliar with the library. You can also see that we use the data-id value as the value for our Vue.el property. This means this Vue app instance will initialize itself on the HTML element with that (randomly generated) id. We bind the rest of our data- attribute values to data properties of the Vue instance so they can be used within the instance or bound to the attributes of our <media-selection-editor> component. We also define the onDispatch method that receives data from the <media-selection-editor> when an image is selected. When we call editor.dispatchEvent we are telling Kentico to update the values associated with the specific property of the current widget that this inline editor is editing — in our case it’s the MediaSelectionItemGuid of the MediaSelectionWidgetProperties class. This is a Single File Component (SFC) and is the preferred way to encapsulate style, layout, and functionality when working with Vue.js. A lot of this is normal Vue.js code and is independent of Kentico — but there are a few pieces worth pointing out. Unfortunately, browsers try to be secure these days (darn! 😣) so we have to be explicit about sending our authentication cookie with requests from one domain (MVC) to another (CMS). We can do this with a browser technology called Cross-Origin Resource Sharing (CORS). We have to tell the fetch request call that we want credentials (cookies) included with the credentials: "include" property/value. Once CORS is enabled we need an endpoint in the CMS accept our requests. I’ve blogged previously about setting up Web Api 2 inside Kentico, which goes quite a bit beyond the Kentico documentation. This is helpful when you need many APIs to access CMS data, but here we only need one endpoint to get access to media library files. I created an IHttpHandler at CMS\CMSPages\MediaLibraryApi.ashx. Since this is a simple handler, I’m responsible for url parsing and response formatting (Web Api 2 would normally handle this for me). I’m also responsible for requiring the request to be authenticated with a call to AuthenticationHelper.IsAuthenticated(). Below is the package.json used to define those client assets I need to build my Vue.js code. Here is the webpack.config.js that defines the compilation process for the Vue components. I put both of the above files at the root of my MVC project folder and I run any npm commands from that same location. I then point my output bundle to .\Content\InlineEditors\inline-editors-bundle.dist.js which is a location that will be automatically pulled into Kentico’s Page Builder bundles. These are loaded anytime you call @Html.Kentico().PageBuilderScripts() in a Razor page view. One thing to note is the externals section in my webpack.config.js. Here I tell Webpack not to bring the Vue.js source into my bundle as a dependency. Webpack will still use it for the compilation process. This allows me to ensure window.Vue exists before Kentico loads my media-selection-editor.js editor definition file by placing a <script src="...-vue.js"></script> tag before any other scripts in my MVC app _Layout.cshtml . If Kentico’s bundling process results in the media-selection-editor.js file to be loaded before Vue.js, it would throw an error that it didn’t know what the Vue name was. Kentico doesn’t support client dependency management so I’m managing it myself. Take a look at how I’m loading different versions of the Vue.js library in Razor conditionally here. Let’s run this thing already! When you add the Media Selection Widget to a Widget Section on the page you will see that no media item has been selected and a button to show the library. If you then click the “Show Library” button you will see the default search results and the search form. You can change the search parameters and submit the form to see more results. This all happens via XHR so the page won’t refresh. It’s also much faster than the Kentico CMS Media Library UI (there’s much less going on here in our simple use case — we only have to support what we want to support 👍). If you select an item by clicking on it, the “No media selected” text will change to the selected image. If you click any of the images in the gallery on the right you can see a larger version of that image in a modal. The widget can also be customized by clicking the gear icon on the right side of the blue widget bar. This is where our MaxSideSize widget property shows up that we defined to use the pre-built Kentico Editing Component. Now if you save the page, the selected image Guid will be persisted to the database as the Widget’s properties metadata. When the page reloads, the MediaLibraryApi.ashx endpoint will be re-queried and the previously selected media will be displayed. Now go to the MVC site and load the page where you added the widget and you should see the selected media item! It’s been a long journey, but I did title this a ‘deep dive’! So, congrats — you are now a little more knowledgeable 👩‍🎓 and ready to concoct your own MVC Widget recipes 👩‍🍳. I plan on continuing to work on this Media Selection Widget / Inline Editor and I will make the code available on Github. When it’s available I will post a link here. Do you have any cool Kentico MVC Widgets you’ve already built or any ideas you’d like to share? Comment below! I’d love to see the open source MVC Widget ecosystem grow — I think this would be great for the Kentico community. You can find more information about me on my site https://www.seangwright.me where you can find links to my tech presence on the web. You can also send me a tweet at https://twitter.com/seangwright. If you need assistance with custom web development in Kentico or other technologies WiredViews might be able to help. Thanks to Sam Warner and Michael Tipton.